A healthy mind resides in a healthy body. All of us claim to know this but seldom accept it and do something to this end. When it comes to fitness, most of us start finding excuses and avoid accepting the fact that we are too lazy to work out or meditate or go for a run. In such a setting, the easiest way to bring a little health consciousness into our lives is by restricting ourselves from consuming fatty food and opting for healthier dishes. And when it comes to opting for a healthy diet, one of the first options that come to mind is a bowl of fresh salad! Salad is one of my personal favorites. More often than not I find myself ordering a bowl of beautifully cut and tastefully dressed salad when I am dining out. The entire look and feel of the dish is so appealing to the eye that just talking about it makes my mouth water! Come to think of it, ordering a salad is way healthier than ordering a burger or French fries or a pizza. And if you team it up with a glass of chilled iced tea or juice, ah, nothing like it! Salads are one of the easiest to make dishes and we can often find most of the required ingredients at home. Just combine some leafy greens with some colorful veggies, add some boiled pasta or chicken to that and toss it with a yummy dressing and voila, you will have a bowl of freshness in-front of you! And the best part, you don’t need to be good at cooking to make yourself a salad. Bring in some creativity and fun and that’s all there is to it. And there’s an amazing range of salads that you can make and consume at different times during the day. Let’s talk about some of the most popular salad choices from around the world. Fresh Garden Salad – This is a colorful assortment of lettuce and fresh raw vegetables including cucumber, tomatoes, carrots, colored capsicums, olives etc. You can simply cut them as preferred and sprinkle some salt and pepper and enjoy! Caesar Salad – This includes a hint of garlic and lemon juice. Toss a mixture of both and some croutons, parmesan cheese, anchovies, egg yolk and sauces of your choice with some salt and pepper to create this salad at home. Tomato-Peach Salad – Combine sugar, salt, pepper, olive oil and cider vinegar and toss some tomatoes and peach wedges with this mixture to make yourself this salad with a twist. Coleslaw – Julienne some fresh carrots and cabbage and toss them with a mixture of low-fat mayonnaise and sugar. You can even skip the sugar and replace it with apples or any other fruit to give the salad a hint of sweetness. Russian Salad – Toss some boiled potato wedges, boiled peas, carrots, capsicum and oranges with low-fat mayonnaise to create this yummy salad at home. Pasta Caprese – Mix cooked and chilled pasta with diced mozzarella cheese, chopped tomatoes, basil, toasted pine nuts and minced garlic and season with salt and pepper to create this tasteful pasta salad. Chicken-Mango Salad – This one is for the chicken lovers. Whisk some lemon juice and honey, some grated ginger and olive oil and toss with shredded grilled chicken and diced mango. Crab Salad – For those who relish sea food, this one is a treat. Mix lump crabmeat with celery, tarragon and chives. Toss with mayo, sour cream, lemon juice and mustard to enjoy the flavor of the sea. I can go on and on but the variety of salads won’t end. It’s the kind of dish which just requires the correct ingredients. The most attractive thing about a salad is that it is a ready to eat food item which takes hardly ten minutes to prepare even for a novice cook. Eat it warm or chilled. Have it as an appetizer, side dish, main course or even as a dessert. A salad can compliment every dish and bring more color and taste to it. I’m heading to make myself a bowl right now. Care to join me? 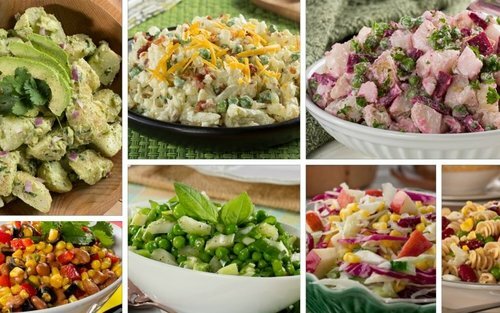 Click here to visit our collection of amazing Salad recipes!